It's one of life's timeless questions: does money make you happy? Research shows it can; not just by earning it, but giving it away. While everyone wants to be happy, many people struggle to understand what will make them happy. We were told as kids that "money doesn't buy you happiness," and once we grow up we learn that yes— you can't literally buy happiness, but having some extra money can make life more pleasant. So how much money is enough for a lifetime of happiness or is this a completely impossible calculation? 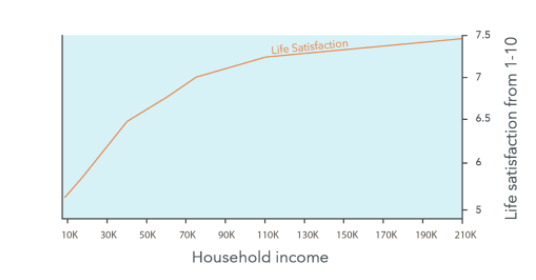 The 80,000 Hours organization carried out research on the relationship between income and happiness. It goes by that name because people spend approximately 80,000 hours working in their life. According to their research, the happiest people of all are the ones who earn on average €32,000 per year, not more, and not less. But it's not about having this or any other income which makes you happy, it's how you spend it. If a life in public service doesn’t suit you, investing in volunteer work could boost your spirit. This is also an option for people who feel that they really don’t have the funds to donate to other causes. It seems that happiness is not exclusively for the wealthy or the full-time do-gooders. It is accessible to everyone, should they choose to do good with the money and their time. Donating is not the secret to an overall happy life (it won’t prevent a broken heart), but it can be a way to enhance your happiness.